Model 005 of the Dojo Pro is named after its unusual Briar shaped tsuba ('Seikyoku'), which like all the Dojo Pro Tsuba is a copy of an actual historical edo age antique. The dark, imposing looking tsuba is made from solid iron – as is the fuchi (band at the top of the handle) AND the kashira (end cap) – all acting in harmony to strongly reinforce the structural integrity of the entire handle in a way that is almost never seen on other swords under the $500 price point (nevermind on swords under $300!). The tsuka/handle assembly itself is exceptionally tight and well put together, double pegged with REAL silk ito wrapped over REAL rayskin that alternates the way it is wrapped in the traditional style, all tightly bound to a quality wooden core. Furthermore, the handle is also properly ergonomically ‘shaped’ to follow the curve of the blade AND fit comfortably into the hand, creating a safe and firm grip - another rarity at this price point. 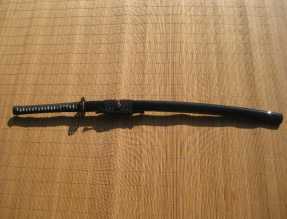 As you can see from the picture, these swords feature high end brass seppa (spacers), hard wearing synthetic black sageo to tie the saya to your belt. The saya (sheath) itself thick and made from quality wood, after all you don’t put hand cut and polished buffalo horn Kurikata, Koguchi and Kojiri on an inferior saya (in the case of the Seikyoku – the saya is black and the buffalo horn accents a rich chocolate brown with a reddish underglow when in direct sunlight). The strength of the fittings ALONE are head and shoulders above any other sword maker anywhere near this price point, but the 28” blade takes it to a whole new level again.. These 1060, through tempered, no-nonsense, monosteel blades are exceptionally HONEST and RELIABLE. Hand forged and solidly built, there is not a trace of pretentiousness about them – no fake hamon, no bo-hi and no BS. They are quite simply just extremely practical, utilitarian blades made according to the Dotanuki forging tradition – a school of sword making that made simple ‘maru’ lamination blades with a reputation for being plain, practical and to the point (speaking of which, the kissaki tip of the blade is reinforced with a diamond shape for added durability and transitioned much nicer than most other hand made monotempered blades at this price point). Weighing 2.6lbs with a point of balance 5” from the tsuba these swords are designed for the CUT, not fluffing around with. In short they are serious blades with serious fittings designed as SERIOUS dojo workhorses..! Designed for heavy cutting practice and frequent dojo use. Thick, expertly tempered, hand forged and sharpened Monotempered 1060 carbon steel blade. All IRON Tsuba, Fuchi and Kashira. Genuine Silk Ito Wrap, Real Rayskin and Brass Menuki handle ornament. Double pegged mekugi. Hand cut and polished buffalo horn Kurikata, Koguchi and Kojiri on Saya with high quality synthetic sageo. I ordered from SBG and the sword was delivered within 15 days (I'm located in France) which is good considering the bank holidays we have here in May this year... The parcel was received with no damage and I was happy with that. - Design is very nice with iron tsuba and blade curvature. - Saya; I can't clearly see buffalo horn but the scabbard mouth is very well finished. 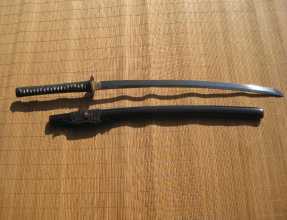 However, the Shitodome are far too loose; helas a default on many chinese made "katana". - Tsuka; I can't tell if it the tsuka ito is made of genuine silk (??? ), it is properly tight (but could be thighter...) and one of the menuki was a bit misplaced (omote side too close to tsuba). -Global assembly is perfect (tsuba, spacers, fushi, kashira...). It seems that it all was made very carefuly as all the parts seems to have been made to fit exacly to the sword, thus putting aside mass production of goods and the assorted defaults. 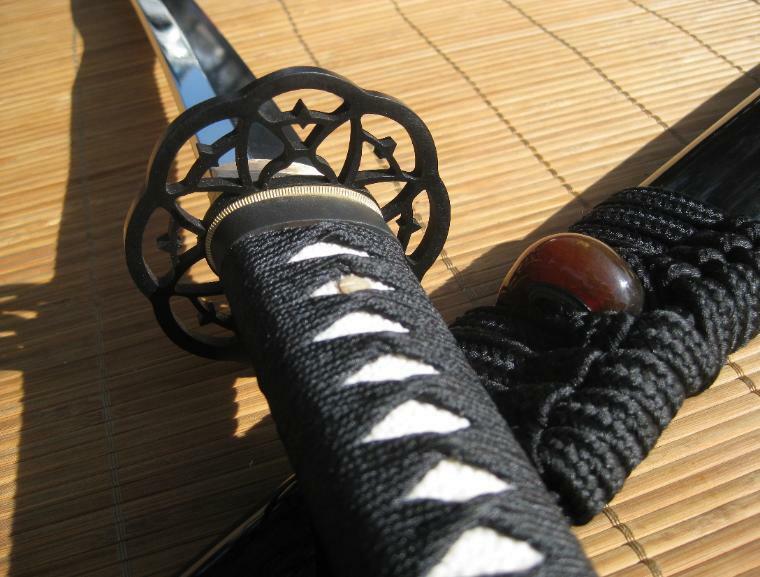 -The blade; a strong and heavy blade which seems lighter than it actually is while making use of the sword, thanks to a very well calculated point of balance, and making of it a fast blade for cutting and handling. As for the finishing, I would have strongly prefered a mirror like polishing, as it has a matt effect as a matter of finishing when you look at it. There are a few scratches on the blade, made I believe during the polishing process; on one hand, they do not affect safety and cutting ability, on the other hand, I would have prefered not to have to see them on my sword, as tiny as they are. The blade remains a bit "waxy" even after several cleaning, but if it is for preventing rust in wharehouse, it is OK and I believe that it will disappear with time and use. 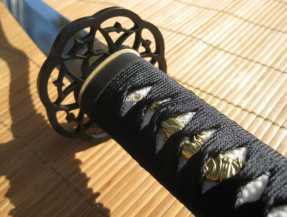 -Cutting ability; sword tested on tatami omote with different types of angles for cut, a very good cutter and fast blade, in spite of the fact that this sword was new for me, which is a good point. It is true that I'm very demanding with any kind of my purchase. I do not regret at all to have purchased this sword and I think I will be happy with it for a long time. This type of 1060 mono steel is a must have at this price and can be a reference.